For the city in New York State, see Ithaca, New York. For other things named Ithaca or Ithaka, see Ithaca (disambiguation). 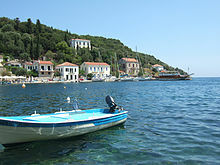 Ithaca, Ithaki or Ithaka (/ˈɪθəkə/; Greek: Ιθάκη, Ithakē [iˈθaci]) is a Greek island located in the Ionian Sea, off the northeast coast of Kefalonia and to the west of continental Greece. Modern Ithaki is historically linked with Homer's Ithaca, the home of Odysseus, whose twenty-year absence is part of the plot of the classical Greek poem and allegory: Odyssey of Homer. The island was named by Pterelaus, the son of Taphius, and king of the Taphians. The Taphians were mariners, pirates and slave-traders from Taphos, an island off the coast of Arcanania in north-western Greece. Pterelaus' sons Ithakus, Neritus (from whom Mount Neriton was named), and Polyctor colonised the island of Ithaki around 1,320 BC, which took the name of his oldest son. In 1479, Ottoman forces reached the islands and many of the people fled from the island out of fear of the new Turkish settlers. Those that remained hid in the mountains to avoid the pirates who controlled the channel between Cephalonia and Ithaca and the bays of the island. In the following five years, the Turks, Toques and Venetians laid claim to the islands diplomatically. Possession of the islands was finally taken by the Ottoman Empire from 1484 to 1499. During this period, the Venetians had strengthened into a major power with an organized fleet. The Venetians pursued their interest in the Ionian Islands, and in 1499 a war between the Venetians and the Turks began. The allied fleets of the Venetians and the Spanish besieged Ithaca, and the other islands. The fleets prevailed, and from 1500 onwards the Venetians controlled the islands. According to a treaty of 1503, Ithaca, Cephalonia and Zakynthos would be ruled by the Venetians, and Lefkada by the Ottoman Empire. By then Ithaca was almost uninhabited, and the Venetians had to grant incentives to settlers from neighbouring islands and the mainland to repopulate it. During the next centuries, the island remained under Venetian control. Ithaca by Edward Dodwell (1821). Flag of the United States of the Ionian Islands (1815 to 1864). 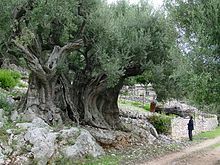 During the British protectorate period prominent citizens of Ithaki participated in the secret "Philiki Etairia" which was instrumental in organizing the Greek Revolution of 1821 against Turkish rule, and Greek fighters found refuge there. In addition, the participation of Ithacans during the siege of Messolongi and the naval battles against Ottoman ships at the Black Sea and the Danube was significant. Ithaca was annexed to Greek Kingdom with the rest of the Ionian islands in 1864. 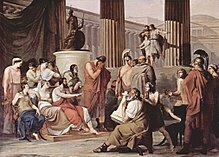 Odysseus at the court of Alcinous by Francesco Hayez (1813-1815). Since at least 1,228 BC, Ithaki has been identified as the home of the hero Odysseus (Odyssey). The word Odyssey is derived from “odos-zeus” and is a compound of two ancient Greek words: odos, meaning: way, and zeus, meaning: mind. In translation: Way of Mind. The name, Odyssey is a metaphor for ones' life struggle. Odyssey was so named by his grandfather, Autolycos, because of the boy's precocious fearlessness, intelligence and stubbornness which would keep him in trouble during his life. In the Odyssey of Homer, Ithaca is described thus:"…dwell in clear-seen Ithaca, wherein is a mountain, Neriton, covered with waving forests, conspicuous from afar; and round it lie many isles hard by one another, Dulichium, and Same, and wooded Zacynthus. Ithaca itself lies close in to the mainland the furthest toward the gloom, but the others lie apart toward the Dawn and the sun—a rugged isle, but a good nurse of young men…"
However, the above description is derived from various translations which are now considered erroneous. It has sometimes been argued that this description does not match the topography of modern Ithaca. Three features of the description have been seen as especially problematic. First, Ithaca is described as "low-lying" (χθαμαλή), but Ithaca is mountainous. Second, the words "farthest out to sea, towards the sunset" (πανυπερτάτη εἰν ἁλὶ ... πρὸς ζόφον) are usually interpreted to mean that Ithaca must be the island furthest to the west, but Kefalonia lies to the west of Ithaca. Lastly, it is unclear which modern islands correspond to Homer's Doulichion and Same. Strabo's explanation has not won universal acceptance. 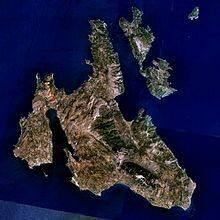 In the last few centuries, some scholars have argued that Homer's Ithaca was not modern Ithaca, but a different island. Perhaps the best known proposal is that of Wilhelm Dörpfeld, who believed that the nearby island of Lefkada was Homer's Ithaca, whereas Same was the present-day Ithaca. However, contrary to Dorpfeld's theory, his predecessor Heinrich Schliemann, who excavated the archaelogical remains at Alalkomenos, near Mount Aetos, was convinced that the site was Odyssey's palace and town. Odysseus leaves from Ithaca for the last trip, illustration from the 1493 Nuremberg Chronicle. Despite any previous difficulties with Homer's description of the island, in classical and Roman times the island now called "Ithaki" was universally held to be the home of Odysseus; the Hellenistic identifications of Homeric sites, such as the identifications of Lipari as the island of Aeolus, are usually taken with a grain of salt, and attributed to the ancient tourist trade. The island has been known as Ithaki from an early date, as coins and inscriptions show. Coins from Ithaki frequently portray Odysseus, and an inscription from the 3rd century BC refers to a local hero-shrine of Odysseus and games called the Odysseia. The Archaeological site of "School of Homer" on modern Ithaca is the only place between Lefkas–Kefalonia–Ithaca Triangle where Linear B inscriptions have been found, near royal remains. In 2010, Greek archaeologists discovered the remains of an 8th-century BC palace in the area of Agios Athanasios, leading to reports that this might have been the site of Odysseus's palace. Modern scholars generally accept the identification of modern Ithaca with Homeric Ithaca, and explain discrepancies between the Odyssey's description and the actual topography as the product of lack of first-hand knowledge of the island, or as poetic license or reliance on corrupted source documents and erroneous translations. Lazaretto Islet (or Island of The Saviour) guards the harbor. The church of The Saviour and the remains of an old gaol are located on the islet. It has been used over centuries as a quarantine station, prison, leper colony and entertainment center. A sign reading: “Strangers are Friends of Ithaki” was erected on the site to greet visitors arriving by boat, but removed sometime in the 1970's. Asteris Island is today known as Ligia or Pera Pagadi. This tiny island is overlooked by Arethusa's Well and Raven's Rock, near the site of Eumaios' piggery. Close by is Eumaios' Cave, a curious refuge for adventurers. It is the location depicted in Odyssey of Homer as the place used by the Suitors to ambush Telemakis on his return from Nestors' palace. The capes in the island include Exogi, the westernmost, Melissa to the north, Mavronos, Agios Ilias, Schinous, Sarakiniko and Agios Ioannis, to the east, and Agiou Andreou, to the south. Bays include Afales Bay to the northwest, Frikes and Kioni Bays to the northeast, Molos Gulf to the east, and Ormos Gulf and Sarakiniko Bay to the southeast. The tallest mountain is Nirito (Neriton) in the northern part (806 m), followed by Nerovoulo (669 m) in the south. Ithaca is a separate regional unit of the Ionian Islands region, and the only municipality of the regional unit. As a part of the 2011 Kallikratis government reform, the regional unit Ithaca was created out of part of the former Kefalonia and Ithaca Prefecture. 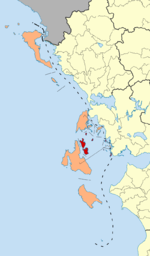 The municipality, unchanged at the Kallikratis reform, includes islets other than Ithaca including two near Cape Melissa, Arkoudi and Atokos to the northeast and the numerous islets in the Echinades Island group (the larger ones being Drakonera, Makri, Oxeia, Petalas, and Vromonas) to the east near the mainland of Aetolia-Acarnania. Its largest towns are Vathy (pop. 1,920 in 2011), Perachori (343), Stavros (366), Platreithias (201), and Kioni (182). Ithaca is the only populated island in this island group. Aetos, Afales, Agios Ioannis, Agia Saranta, Anogi, Exogi, Frikes, Kalivia, Kathara, Kioni, Kolieri, Lachos, Lefki, Marmaka, Perachori, Piso Aetos, Platrithia, Rachi, Stavros, Vathy. ^ "Vathi, Ithaca". National Gallery Scotland. Retrieved 25 January 2017. ^ "Port Vathi". Ithacan Philanthropic Society. 2015. Retrieved 25 January 2017. Bourchier, James David (1911). "Ionian Islands § History" . In Chisholm, Hugh (ed.). Encyclopædia Britannica. 14 (11th ed.). Cambridge University Press. p. 729. ^ a b c "Ithaca". Encyclopædia Britannica. 16 July 2010. Retrieved 25 January 2017. ^ Vella, John.(2016). "Homer’s Ogygia: An Imaginary or a Historiography? ",Athens:ATINER'S Conference Paper Series,No:MDT2016-2007 . ^ Homer (1919). "9.21-27". The Odyssey with an English Translation (in Ancient Greek and English). Translated by Murray, Augustus Taber. London, UK: William Heinemann, Ltd. Retrieved 2016-06-06 – via Perseus Digital Library. ^ a b Squires, Nick (24 August 2010). "Greeks 'discover Odysseus' palace in Ithaca, proving Homer's hero was real'". The Telegraph. Retrieved 25 January 2017. ^ Wilhelm Dörpfeld, Alt-Ithaka (1927). ^ Map of Homer's Ithaka, Same and Asteris according to Wilhelm Dörpfeld. Digital library of Heidelberg University. ^ Frank H. Stubbings, "Ithaca", in Wace and Stubbings, eds., A Companion to Homer (New York 1962). ^ Squires, Nick (24 August 2010). "Greeks 'discover Odysseus' palace in Ithaca, proving Homer's hero was real'". Retrieved 27 March 2018 – via www.telegraph.co.uk. ^ "Greek archaelogists discover Odysseus' palace in Ithaca - GreekReporter.com". greece.greekreporter.com. Retrieved 27 March 2018. ^ "Geography of Ithaca". Greeka.com. (in French) Henry Schliemann, Ithaque, le Péloponnèse, Troie : recherches archéologiques, Paris, C. Reinwald, 1869. (in French) Claude Dervenn, Iles de Grèce d'Ithaque à Samothrace, Paris, Impr. auxiliaire ; J. de Gigord. (S.M. ), 1939. (in French) Gilles Le Noan, À la recherche d'Ithaque : essai sur la localisation de la patrie d'Ulysse, Quincy-sous-Sénart, Éd. Tremen, 2001. Tzakos, Christos I. Ithaca and Homer: The Truth, The Advocacy of the Case. Translator: Geoffrey Cox. Archived from the original on 2007-05-16. Wikimedia Commons has media related to Ithaca.